The VISTA-128BPT is a powerful member of the Honeywell family of commercial alarm panels, integrating burglary, CCTV and access control functions. Many features are available that extend the applications of the VISTA-128BPT while simplifying end-user operation. 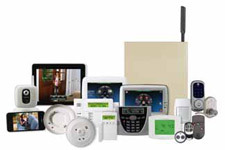 It is listed for residential burglary, residential fire and commercial burglary applications, and is compatible with a wide range of AlarmNet communications products for alarm reporting, uploading /downloading and remote services. View or download the 128BPT User Manual. 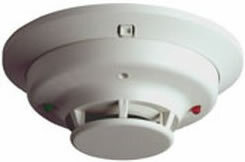 System Sensor’s i3 series Photoelectric Smoke Detector, a 2-wire plug in smoke detector that represents a significant advancement in conventional detection. The i3 family is founded on three principles: Installation ease, Intelligence, and Instant inspection. View or download the 2W-B spec sheet. Honeywell’s 5193SD/SDT Addressable Photoelectric Smoke Detector is designed to provide open area protection and to be used with compatible UL-listed Honeywell control panels that support V-Plex technology. The detector incorporates a state-of-the-art optical sensing chamber and an advanced microprocessor. The 5193SDT also features a restorable, built-in, fixed temperature (135° F/57.2° C) thermal detector. View or download the 5193SD spec sheet. The System Sensor CO1224T CO detector provides early warning by using electrochemical sensing technology to measure carbon monoxide levels in the air. View or download the CO1224T spec sheet. The 5800CO is designed to provide early warning to the user well before the CO reaches a fatal level. The detector’s CO sensitivity is evaluated to UL 2034 code standards. The 5800CO is powered by a 3V battery. The 5800CO is specifically designed for system operation and is fully listed to UL 2075 as a system supervised detector. * It contains a piezoelectric horn which generates the ANSI S3.41 temporal 4 pattern in an alarm condition. The detector consists of an electrochemical carbon monoxide sensor assembly coupled with a wireless transmitter. The transmitter can send alarm, trouble, end-of-life, tamper and low battery condition messages to the alarm panel. View or download the 5800CO spec sheet. Honeywell’s 5808W3 is a 3V lithium powered, photoelectric smoke/heat detector with a built-in wireless transmitter. Its built-in, fixed temperature (135°F) thermal detector is capable of sensing a pre-freeze condition if the temperature is below 41°F. 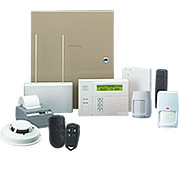 The wireless transmitter can send alarm, tamper, maintenance, and battery condition messages to the system’s receiver. View or download the 5808W3 spec sheet. 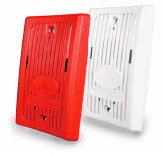 The 280B-PL Series heat detectors offer fixed temperature or combination rate-of-rise and fixed temperature features. View or download the C280 spec sheet. The GX91/GX93 Series mini-horn is a high quality remote signaling appliance that offers dependable remote annunciation. The GX93 is listed for use with both filtered and unfiltered power. View or download the GX93 spec sheet.